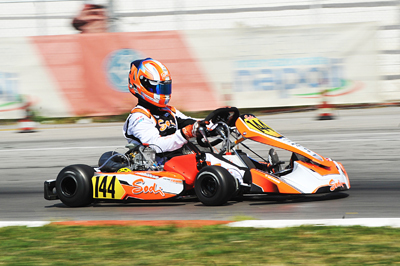 The International Karting season is continuing with WSK Euro Series. 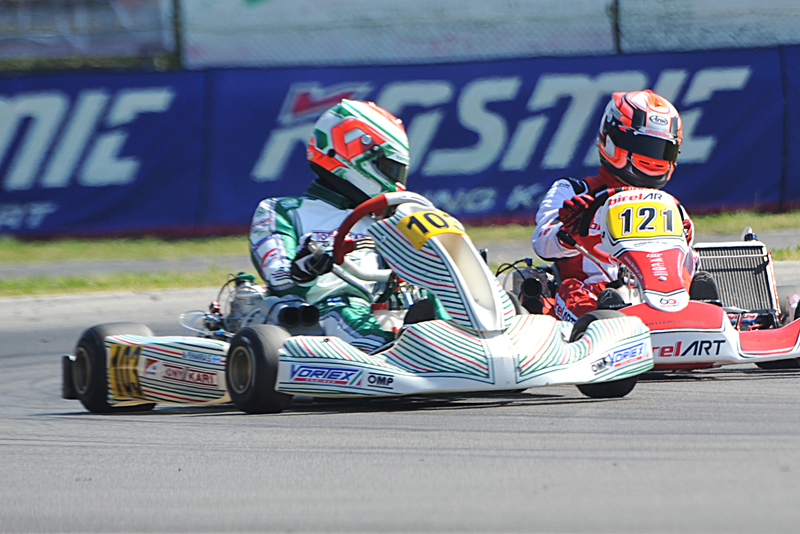 The European Series by WSK Promotion has successfully started its battle last weekend from Sarno (SA). This new campaign started from the south of Italy and will now head to Central Europe. Eyeing the next round that is scheduled on the French circuit in Angerville from April 25th to 28th, the attention switched to classifications. The opener has launched new names to the top of the charts: a complete change among the potential winners of the four categories are going to be the benchmarks in the following rounds. Above, the podium in Sarno during the prize giving after the OK Final. Dino Beganovic showing his cards in OK.
Dino Beganovic (above, Tony Kart-Vortex-Bridgestone) run a strong weekend in Sarno being constantly on top of OK. The double win in Prefinal and Final earned the Swede 89 points and the classification lead. In the Final, the envisaged challenge with another favourite to the victory Dilano van ‘t Hoff (below on the right, Exprit-TM) could not happen. Started from the front row next to Beganovic, the Dutch had to stop early on after being on top after heats and second in Prefinal. He is still third in the classification at 30 points though. 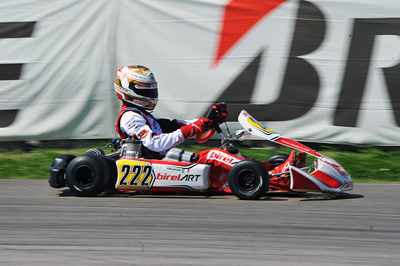 The second place of the classification is currently occupied by the Italian Luigi Coluccio (below left, BirelArt-TM), who scored 48 points after coming second behind Beganovic the Final. The Finn Nikolas Pirttilahti (KR-Iame) also had a good start getting on the podium in the Final. The Spaniard Genis Civico (Croc-TM) is equal on points, 23, with him and both stand in fourth. 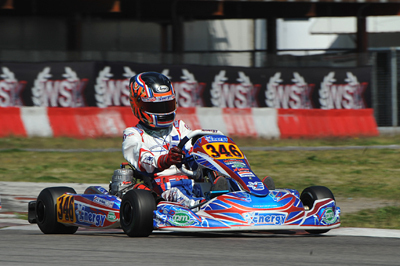 WSK Super Master Series Dexter Patterson (KR-Iame) has some ground to recover instead. The Scot has never been in the fight for the victory and is currently 12th in the classification. Nikita Bedrin setting the pace in OK Junior. 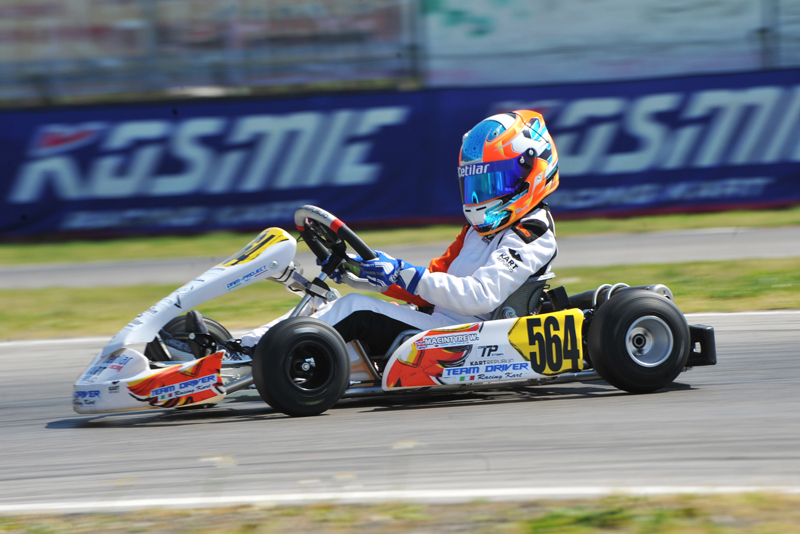 The on-off results of the early season seem to be in the past for the Russian Nikita Bedrin (above, Tony Kart-Vortex-Vega), who grabbed all the available points last Sunday. He won all the races of the weekend, from heats to the Final. Bedrin is leading with 90 points and, behind him, the rivals are fighting a tight battle. The Dutch Rober De Haan (below left, Energy-TM) is second at 41 points and is followed by his fellow countryman Thomas Ten Brinke (below right, FA Kart-Vortex). The latter got on the podium of the Final leading the Brit Jamie Day (Exprit-Vortex). Day is currently fifth in the classification at 30 points and follows the Australian James Wharton (FA Kart-Vortex), who won Prefinal B and is fourth at 38 points. The winner of WSK Super Master Series is chasing the pack in OKJ too: Andrea Kimi Antonelli (KR-Iame) is in fact only 11th after the Sarno's opener. Macintyre takes the lead of 60 Mini. William Macintyre (above, Parolin-TM-Vega) managed to recover from a DNF in one heat and completed a great comeback winning Prefinal A. The Final was another hard-fought battle and the victory launched the Brit to the top of the charts at 80 points. The Jamaican Alex Powell (below left, Energy-TM) also had a fruitful weekend. He has always been among the quickest and is currently second in the standings at 58 points. The third place is occupied by the Russian Aleksandr Tibekin (below right, DR-TM) who collected 40 points thanks to several good placings. The Belgian Douwe Dedeker (Parolin-TM) follows at 39 due to the victory in Prefinal B. 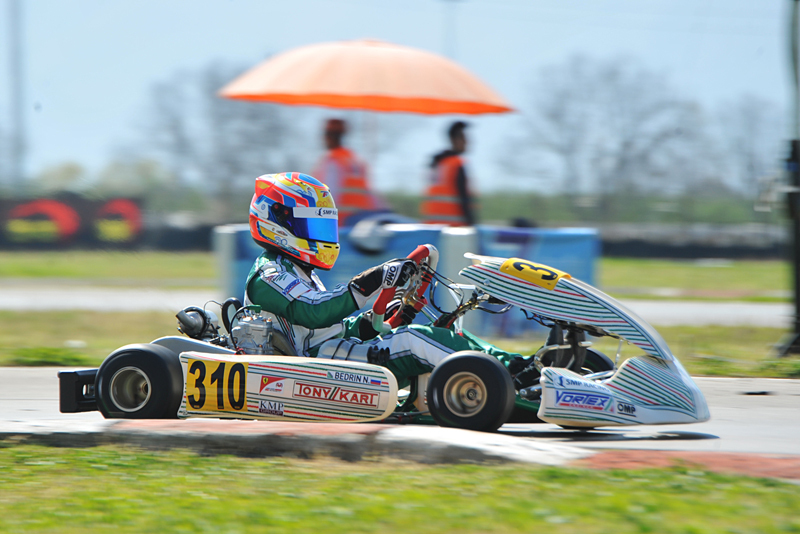 The third place in the Final allowed the Italian Andrea Filaferro (Tony Kart-TM) to reach 39 points too, while WSK Super Master Series winner Rashid Al Dhaheri (Parolin-TM) is only 13th. 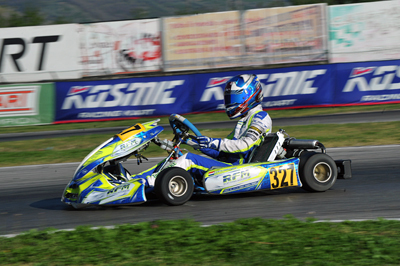 Simo Puhakka leaps to the lead in KZ2. KZ2 also shows a surprise on top of the classification: following a slow start with the 12th place of qualifying heats, Simo Puhakka (above, Tony Kart-Vortex-Bridgestone) started collecting points recovering up to P2 in Prefinal B. The monologue of the Finn in the Final earned him further heavy points: despite several attempts, an ace of the likes of the Dutch Bas Lammers (Sodikart-TM) could not steal P1 from the Finn and had to settle for an honourable P2. Puhakka is leading the classification at 70 points, while Lammers (also not very effective in the heats) is only fourth at 40 points but is the only winner of WSK Super Master Series in the top ten. The French Anthony Abbasse (below left, Sodikart-TM) won Prefinal B and always ended within the top 3, which placed him second at 59 points. 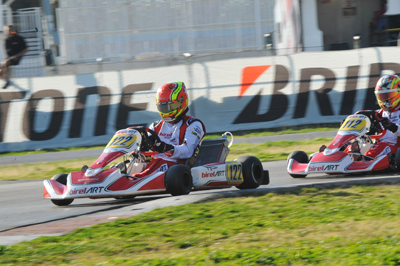 The Italian Riccardo Longhi (below right, BirelArt-TM) had a similar path and Prefinal B’s victory leading his teammate Alex Irlando placed him third at 38 points. Irlando had a positive weekend and is fifth at 32 points. 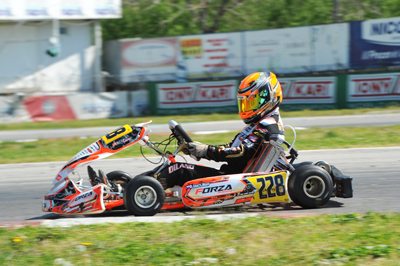 The second round of KZ2 will take place in Lonato next June 23rd. 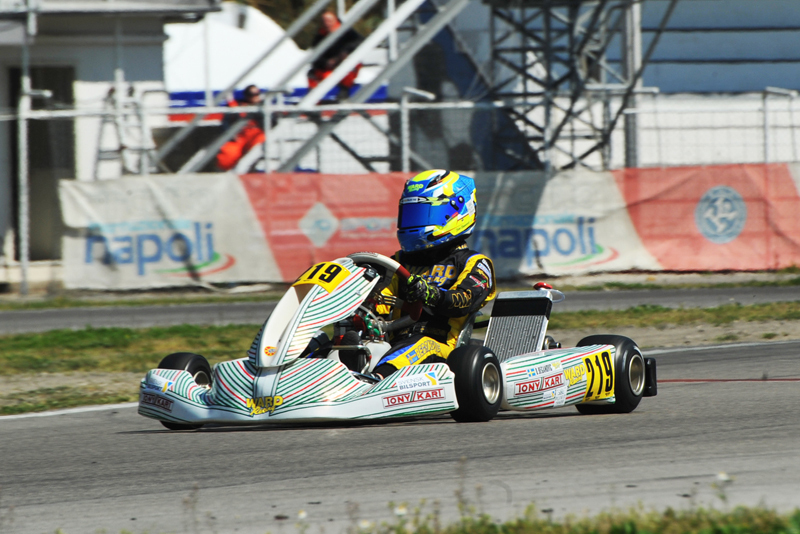 Named the first leaders of the Italian ACI Karting Championship. 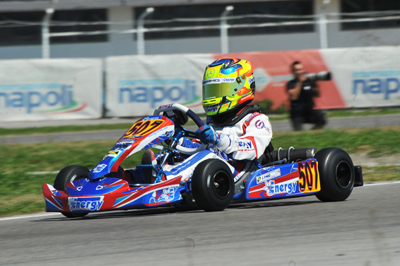 The Italian rounds of WSK Euro Series are valid also as Italian ACI Karting Championship for the classes OK and OK Junior. After the first round, the classification of both categories mirrors that of WSK Super Master Series with Baeganovic, Coluccio and Van ‘t Hoff locking out the top three in OK, Bedrin, De Haan and Ten Brinke that of OK Junior. 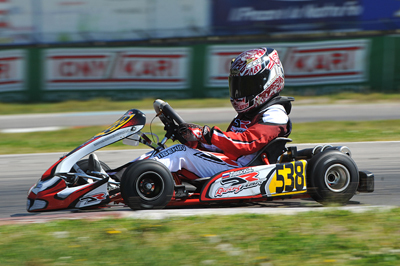 The next round of the Italian Karting Championship will be the WSK race in Lonato on June 23rd.